The Alfred Hitchcock Hour Complete Collection DVD Review It’s a magnificent accomplishment, and each of the films adorning these handsome box sets is positively overflowing with the stars of the day - James Mason, Robert Redford, Jayne Mansfield, Christopher Lee, Martin Landau, David Carradine and Peter Fonda, to name just the merest smattering. In a career spanning six decades Alfred Hitchcock directed over 50 feature films, including such staples of suspense as Psycho, The Birds, North by Northwest and The 39 Steps. 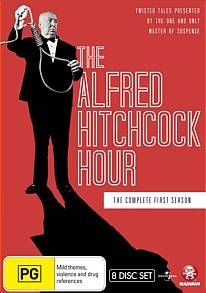 An expanded continuation of Hitchcock’s feted television project Alfred Hitchcock Presents, the series here offered as The Alfred Hitchcock Hour consists of 93 hour-long vignettes originally presented by the master himself between 1962 and 1965, the final three years of the program’s decade-long run. Released as a series of 8-disc box sets, Madman have gathered all episodes of the show’s final three seasons and released them locally for the first time. Each of the three seasons runs no less than 27 hours and includes all 31 episodes of that year’s run in their thrilling and incomparably murderous entirety. It’s a magnificent accomplishment, and each of the films adorning these handsome box sets is positively overflowing with the stars of the day - James Mason, Robert Redford, Jayne Mansfield, Christopher Lee, Martin Landau, David Carradine and Peter Fonda, to name just the merest smattering. Each of the stories is bookended by Hitchcock himself in his rightly iconic opening and closing sequences, and each revolves around a tale of intrigue, murder and bloodshed that is neatly wrapped up by the episode’s conclusion. Although only one of the episodes was directed by Hitchcock himself (‘I Saw the Whole Thing,’ Season One) the entire series is a masterpiece of suspenseful filmmaking. Written by the likes of H.G. Wells, Ray Bradbury and James Bridges, who went on to pen such hit features as The China Syndrome and Urban Cowboy, the stories are subtle, engrossing and almost universally accomplished in their taut narrative manipulations designed to keep you guessing, often literally, right until the end.